It seems so obvious, but until recently the most efficient use of biogas, on the farm to provide the fuel to power the farm vehicles which devour the most fuel on the farm, was simply not done. Tractors which ran on biogas had not been developed as an off the shelf item, and it was only in the summer of 2012, at the AD and Biogas (Now Bioenergy) Exhibition that the first biogas tractor was placed on public view*. For the last 5 years or so the media has been keen to write articles about buses which run on biogas, dubbing them as “human waste powered”, and some have described their biogas fuel source a lot more crudely than that, to attract more attenion from the public! Worthy though biogas powered buses and transport fleets are, when biogas is produced on-farm, the carbon footprint will be far less for farms that power their own tractors using their own fuel. Furthermore, why would a farm manager seek to import fossil fuel derived deisel fuel, rather than use the biogas product of their own business? Oil brought into the farm must be transported from the oil refinery at a real cost, and although the tax on farm deisel fuel may be low or non-existent in many nations bought-in fuel is still a consideration for its negative effect on cashflow when each invoice lands on the accountant’s desk, as an outgoing. Now, we have news from New Holland tractors which is very good news for the biogas industry, and with the large numbers of on-farm biogas plants now planned and under construction more tractor suppliers are bound to follow. The alternative fuel technology powering that tractor is a promising peek into the future of agriculture, one where farms will be energy independent and able to reduce their environmental footprint. So far we have been takling about Europe, so now is time to discuss US progress in the design of the “biogas tractor”, but despite the author assuming that there would be examples of US biogas tractors making similar advances to those that are taking place in the European Tractor Market, we found none during our web search. The engine is a 3.0 liter, four-cylinder unit, producing 100 kW/136 hp rated, 105 kW/143 hp max power and a maximum torque of 542 N·m (400 lb-ft) at transmission input shaft. Gas storage is handled in nine fuel tanks, with a capacity of 300 liters in total. Do you operate a biogas plant with upgrading equipment which allows you to produce biomethane and run a biogas tractor? 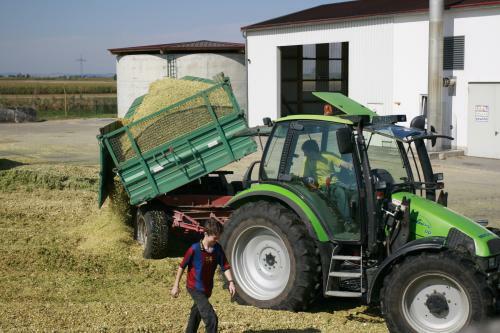 If so please provide your comments on any related subject, but we would be particularly interested to know if you run a biogas plant, from which you would prefer to operate a biogas tractor, or a nonrenewable fuel powered tractor fleet.